Paul McCartney will make his first-ever Nashville appearance Monday July 26, 2010, when he brings his Up and Coming 2010 Tour to the Bridgestone Arena in downtown Nashville. The tour will feature the former Beatle and his band in unique venues, places and locations; cities he’s never before played as well as familiar markets he’s not recently visited. Tickets go on sale Monday, June 7 at 10:00 AM and will be available at the Bridgestone Arena Box Office and all Kroger locations, by logging on to www.ticketmaster.com or by calling 1-800-745-3000. 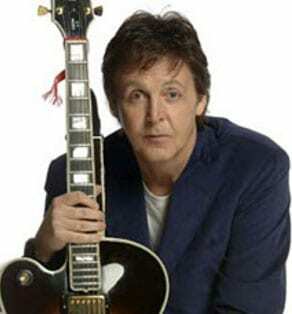 McCartney’s recent live shows have garnered unprecedented reviews from fans and critics alike. He’s pushed boundaries, performed to millions and made global news with monumental shows including performances in Moscow’s Red Square, outside of the Coliseum in Rome, the largest outdoor show ever in the Ukraine, his first performance in Tel Aviv and a live performance into a NASA space station. Last year’s Summer ’09 Tour began in earnest with an already legendary inaugural run of shows at New York’s CitiField Stadium, the site of the former Shea Stadium where The Beatles played the 1965 concert that set the precedent for the modern-day stadium rock show. The Up and Coming 2010 Tour, which kicked off in late March, are McCartney’s first U.S. shows since his five-week ‘Summer Live ‘09′ tour, which was prefaced by a triumphant sold-out headline set at the 2009 Coachella festival and a surprise performance for CBS’ Late Show with David Letterman on the marquee of the Ed Sullivan Theater (inside which The Beatles made TV history decades ago) that drew throngs packing Broadway from Columbus Circle to Times Square. The new McCartney show features a typically diverse set list, drawing on 2 plus hours’ worth of selections spanning the catalogues of The Beatles, Wings and McCartney’s solo career, including tracks from the 2008 album, The Fireman’s 2008 album, Electric Arguments, and potentially some songs never-before-played-on-U.S.-soil added to the set list.